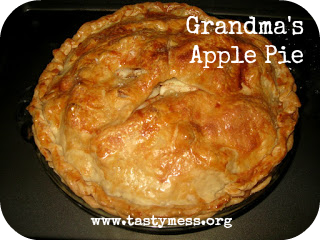 One of the first things I ever remember watching my grandmother make is apple pie, it has to be my first real food memory, I was only about 4 years old. My favorite part was watching her try to get the peel all the way off the apple in just one piece...and eating the pie of course! Maybe that's why I turned to apple pie when I first started wanting to stretch my baking wings back when I was a teenager, it has a special place in my heart and memories and such a simple dessert can be incredible if you put a little effort into it. Let me say this first: Don't. Fear. Pie Crust. So many people have told me that they're afraid to try making a pie crust from scratch and I have to admit, I used to be too. Store-bought pastry is great in a pinch, but if you have about an hour of time go ahead and give my basic pie crust recipe a try. You can make it in a food processor or even using a stand mixer if you don't have a processor on hand. The true key to a great pie crust is super-cold butter. I like to cube up my butter, pop it in a bowl and then put it in the fridge to chill again for another 15-20 minutes. Trust me, it's worth it! I've tried a few variations of pie crust over the years, some using a blend of shortening and butter, but I keep coming back to this all-butter recipe I found years ago (I think through Food Network). It never lets me down and I just love the flavor. Pulse together the flour, sugar and salt in the bowl of a food processor, then add in the cold butter one stick at a time, pulsing a few times until it resembles a coarse meal, or has a sandy texture. Add in the vinegar, then gradually dribble in up to 1/3 cup ice water, pulsing 4 times until just combined. Turn out the dough onto a clean surface and press together. Wrap in plastic wrap and press into about a 1"-thick disc. Refrigerate at least an hour before using. Preheat the oven to 350. Remove your crust from the fridge and divide it into 2 equal parts. Roll out the first section until it is thin enough and large enough to lay in a 9" pie plate with a slight overhang. Pierce the crust all over with a fork. Gently line it with foil, then fill it with dried bean or pie weights. Bake in the oven for about 20-30 minutes, then remove and set aside to cool slightly. Remove the pie weights and foil and assemble the filling. Combine all filling ingredients in a large bowl and mix well until thoroughly combined. The cinnamon, sugar and fruit juices should be creating sort of a syrup. If the mixture looks a little too runny, just add in a few sprinkles of cornstarch and toss well. Heap the apple filling into the pie crust, then top with the second rolled-out crust, crimping the edges by hand or with a fork. Cut a few slits in the top for venting, then brush the top with the beaten egg mixture and sprinkle about 1 tsp. sugar on top before baking. Bake at 350 degrees for about 45 minutes to an hour, but check on it periodically to make sure it isn't bubbling over or cooking too quickly. I like to place a baking sheet on the rack under the pie to catch any drips. Let sit for at least 15 minutes before serving and enjoy with fresh whipped cream or ice cream.